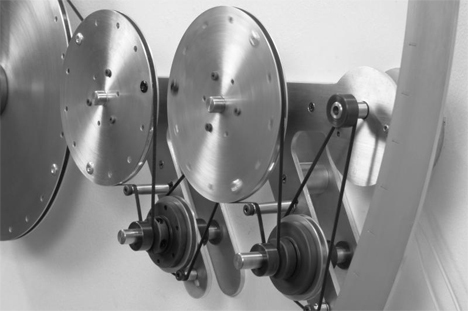 The clock runs on a 60-RPM (rotations per minute) motor, causing the smallest piece to rotate once a second. The next piece rotates every five seconds. 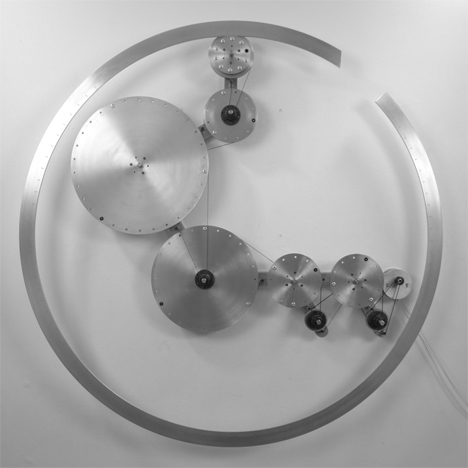 Subsequent pieces rotate every minute, five minutes, hour, day, month, year and decade. The large arc around the outside of the piece is controlled by the decade pulley. The arc will rotate once a century. 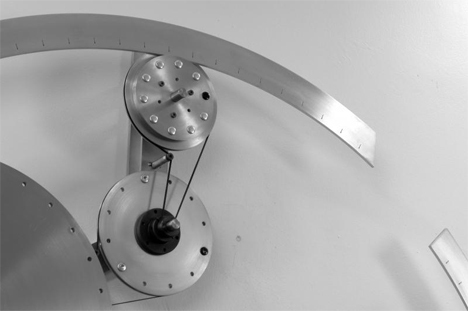 When it does, the arc will fall off of its track, effectively marking the end of the clock’s life. From the first second to the last of the 100 years, the ratio between the 60-RPM motor and the large arc is 1:31.6 billion. The clock is part of Wang’s “Time in Six Parts” series. 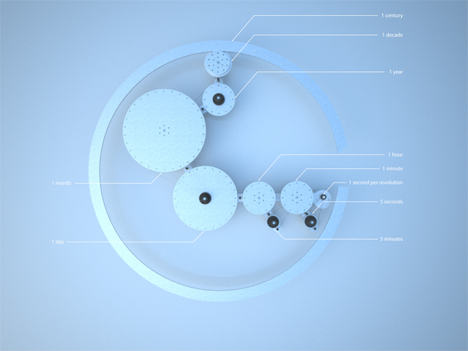 His goal is to change people’s perceptions of time, to get spectators to slightly shift their perspective. The clock breaks down a century – a period of time difficult for most people to fathom – into much more easily digestible bits. Want to measure out a century in your own living room? Wang’s “3.16 Billion Cycles” is available for sale in a limited series of five pieces. See more in Clocks & Watches or under Gadgets. September, 2009.